I was extremely surprised when I liked Cinder. A cyborg retelling of Cinderella didn’t sound like my thing. But when I loved it, I figured I had found a series that would be worth sticking through to the end. As a sequel, Scarlet is surprisingly unique. I wouldn’t go so far as to say it could be a stand-alone novel, but it doesn’t rely on Cinder more than it needs to. It has its own story that slowly weaves itself with that of Cinder’s. Scarlet lives on a farm with her grandmother. They are the only two people there, so when her grandmother vanishes, Scarlet is worried. There are too many signs that her grandmother did not go willingly and Scarlet is determined to find her. That’s when Wolf enters her plan. As her only possible link to her grandmother, she must rely on him to reach her grandmother in time. Scarlet and Wolf aren’t my favorite relationship. Yet, anyway. There’s something that just feels a little forced and not quite right. I believe in the attraction they feel for each other, but that’s about it. I’m really hoping Meyer expands on this relationship as much as possible in the upcoming novels. We can’t forget about Cinder, though. She’s been captured and put in prison, held until the Lunar queen is ready to get rid of her. Cinder doesn’t wait around for that moment and breaks out. She has questions and she is going to find the people that have the answers. 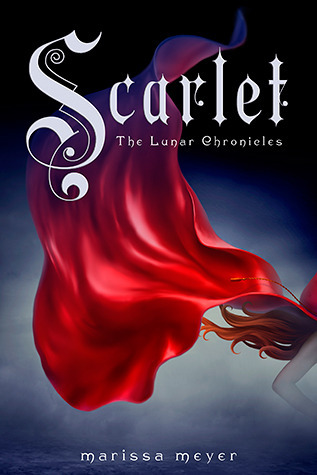 Scarlet sets a fast pace, but it’s easy to follow along. The jumping perspectives didn’t bother me at all, even though I know some people don’t enjoy that. It works for this book. Aside from Scarlet and Wolf’s relationship, there wasn’t much that I didn’t completely love about this novel. I’m looking forward to reading what comes next. This entry was posted in Dystopia or Post-Apocalyptic, Something a Little Different, Young (and New) Adult and tagged Dystopia/Post Apocalyptic, Fantasy, Marissa Meyer, Science Fiction, Young Adult.